This guide to Monteverdi's music is constructed in three sequences. The first is a catalogue of Monteverdi's works, both surviving and lost, in as near as possible date order, followed by a list of undated manuscript sources. In the case of sources containing more than one work, the contents of the volume are listed in the order in which they appear in the earliest, or the only, source (this order is not always followed in later and modern editions – see Chapter 3, above). The second sequence is a catalogue, by short title only, of prints and manuscripts containing contrafacta of Monteverdi's music: that is, adaptations of his settings by a different author to texts that are usually sacred or spiritual in character (the first lines of these settings are given in the Index). The third sequence is an index of first lines and titles, which serves as an index both to the catalogue and to the discussion of individual works in the text of this book. Each work can be traced in the catalogue from the index through an identifier, which includes the date of publication or first performance, or the year(s) in which a work, now lost, is discussed in Monteverdi's letters or another source; manuscripts are identified by the sigla for the library in which they are located. Dates or library sigla followed by [CF] refer to contrafacta. Dates followed by a superscript number follow the convention found in RISM (Répertoire international des sources musicales, the International Inventory of Music Sources), specifically in the volume Recueils imprimés XVIe-XVIIe siècles (Munich-Duisburg, 1960). It is now more than twenty years since the appearance of The New Monteverdi Companion, edited by Denis Arnold and Nigel Fortune, to whom this book is dedicated. During those years the re-evaluation of Monteverdi and his work by performers and historians alike has proceeded apace and shows no sign of abating. New generations of performers now work comfortably with the instruments of Monteverdi's day and continue to explore the types of vocal production with which he might have been familiar; and listeners can now experience a wide range of live and recorded interpretations of Monteverdi's music. More is known now about the context in which Monteverdi worked, and fresh questions have been asked about his musical output, not least those arising from the so-called "New Musicology". On his operas alone three new books have appeared within the last five years. The Magnificat is a ‘canticle’, a non-metrical, song-like passage of text drawn frombooks of the Bible other than the Book of Psalms. The Magnificat – the Song of the Blessed Virgin Mary – comes from the Gospel of St Luke, 1:46–53, and represents Mary's joyful response to the message given her by the Angel Gabriel that she was to bear the son of God. In the Catholic liturgy this canticle was set to be read or sung daily towards the end of the main evening Offce of Vespers. It forms the climax of the service, and while it is being sung a priest censes the altar. The Magnificat is preceded by the singing of an antiphon specific to the particular day on which it was being performed, and followed by the ‘Gloria Patri’ and a repetition of the antiphon. This whole unit is then followed by a prayer and the dismissal of those who have celebrated Vespers. certainly not rich, but neither am I poor; moreover, I lead a life with a certain security of income until my death, and furthermore I am absolutely sure of always having it on the appointed pay-days, which come every two months without fail. Indeed, if it is the least bit late, they send it to my house [in the chancellery of S. Marco]. Then as regards the cappella I do as I wish, since there is the assistant choirmaster … and there is no obligation to teach. Monteverdi's reference here to his assistant choirmaster is a reminder that he was not alone in shouldering the responsibilities of providing music for S. Marco. He inherited, and was later able to appoint, assistants who were not only performers, but also able composers of sacred music – Marc'Antonio Negri (singer and assistant choirmaster from 1612), Alessandro Grandi (singer from 1617, assistant choirmaster from 1620) and Giovanni Rovetta (singer from 1623, assistant choirmaster from 1627). Monteverdi's Vespro della Beata Vergine was published while he was maestro di cappella at the Gonzaga court at Mantua in northern Italy. However, no performance of the Vespers, nor of any of its constituent parts, is known to have taken place at Mantua or, indeed, anywhere else during Monteverdi's lifetime; and there is little documentary evidence that relates directly to the composition and publication of the music. This is usual with respect to volumes of church music in the early seventeenth century, but it is often possible to relate such publications to the composer's career. At Mantua, however, Monteverdi was not, so far as we know, employed specifically as a church musician, and it is thus more difficult to account for his having produced a major collection of church music. The understandable frustration that this has caused for historians and performers alike has given rise to various hypotheses, some more solidly grounded than others, about why Monteverdi wrote and published this particular collection and why it takes the form that it does. 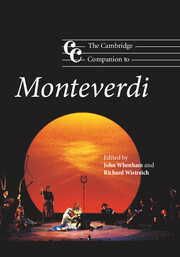 Some of these can be evaluated fairly readily on the basis of documentary evidence, including the evidence of the publication itself, some require an understanding of the liturgical context, and others an understanding of circumstances in Monteverdi's career that might have prompted him to publish church music in 1610. This Appendix contains the texts, with translations, of all the items that Monteverdi published under the heading ‘Vespro della B[eata] Vergine’ in his 1610 print, together with plainsongs for the versicle and response, the psalms, hymn, sonata and Magnificat. In the case of this latter group, the texts and plainsongs represent an attempt to establish as nearly as possible the raw materials with which Monteverdi worked. A fundamental problem for both historians and analysts is that we do not know on which liturgical sources Monteverdi drew for his texts and plainsongs. One thing is certain, however: that LU, which is so often used in analyses of the 1610 Vespers, is an unsuitable starting point for such endeavours. A comparison between the readings of the 1610 print and modern compilations of liturgical texts and plainsongs such as LU and the Antiphonale Monasticum (henceforth AM) reveals a number of small, but interesting variants. An obvious question that these raise is whether they represent standard Roman usage in the late sixteenth and early seventeenth centuries, or whether Monteverdi was working from a local use, such as that of the ducal church of Santa Barbara in Mantua. ‘Dixit Dominus’, verse 8: all but one of the part-books have ‘bibit’ instead of ‘bibet’ (the final syllable is missing in the Bassus part); further, while the A, T, B, Q and S part-books have ‘exaltabit’, the Cantus part has ‘exaltavit’. Strictly speaking, the modern revival of interest in Monteverdi's 1610 Vespers dates from 1834, when Carl von Winterfeld, one of the founding fathers of historical musicology, published transcriptions of the opening of ‘Dixit Dominus’ and the ‘Deposuit’ section of the sevenpart Magnificat to illustrate his extended discussion of the 1610 publication. In the early years of this century the ‘Sonata sopra Sancta Maria’ was published in modern editions by Luigi Torchi (Milan, 1907) and, in a ‘versione ritmica e strumentale’, by Bernardino Molinari (Milan, 1919). But it was not until 1932, when it appeared in Gian Francesco Malipiero's collected edition of Monteverdi's works, that all the 1610 Vespers music was made available, and not until February 1935 that it was revived in performance in Zörich, and then at Winterthur and Lausanne, by the Häusermann Privatchor under Hermann Dubs. The edition used for these performances was prepared from Malipiero's by Hans Redlich, and it formed the basis of a number of other first performances of the Vespers over the following decade: in New York under Hugh Ross (1937); on Radio Beromünster (Switzerland) under Hermann Scherchen (early and mid-1940s); in Brussels under Paul Collaer (1946); and at Central Hall, Westminster, London, under Walter Goehr (14 May 1946). The last of these was organised by the composer Michael Tippett, who also wrote his Preludio al Vespro di Monteverdi for the performance in order to help the choir find their first notes. Monteverdi's comment that the Vespers settings and sacred concertos were ‘suited to the chapels or chambers of princes’ indicates that he expected his music to be performed by the expert singers and instrumentalists employed at a court like Mantua or at major churches like St Peter's, Rome, or St Mark's, Venice, or perhaps in one of the musical establishments presided over by a cardinal. And since court and Church were the major employers of professional musicians in the late Renaissance, such establishments would have included the finest performers of the day. The sacred concertos of the 1610 print were certainly designed to show off the accomplishments of such performers, and the styles and techniques that they exemplify range from wellestablished traditions of vocal and instrumental virtuosity to the most up-to-date rhetorical styles of Florentine continuo song and opera. Virtuoso singers were highly prized in court circles, the best of them receiving much higher payment than the composers who supplied them with music. Unlike the star singers of today, however, whose voices are trained to produce a rich, dark, powerful tone that can be projected over a large orchestra, virtuosos of Monteverdi's day cultivated lighter and more flexible voices with the ability to articulate notes very rapidly in the throat. This last ability was particularly important since they were expected, especially when singing solo, to grace the lines that they sang with ornate and technically difficult improvised ornamentation; and their ability to do this was one of the most admired aspects of their art.